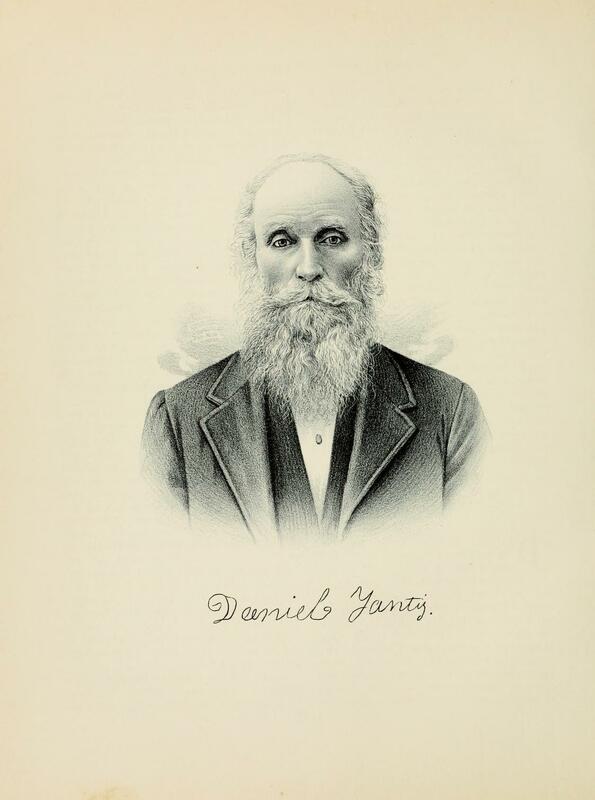 DANIEL YANTIS. The mind of a man who has lived four-score years, is to him a kingdom in which he can send out the messengers and servants of thought, memory and reflection, and live over the pleasures of the past that have grown intense under the magnifying influence of time. He realizes in a subdued way the pains which at the time of their experience, seemed tragedies, modified and made interesting by the lapse of years. Content has come to gently round off the afternoon with its golden glow of sunset. Our subject, who has ascended the sunlit heights, looks back over a broad expanse of experience in a land where experiences are ever fresh and invigorating. On the opposite page appears a portrait of Mr. Yantis, who is an old settler and successful farmer and stock-raiser living on his homestead, located on sections 29 and 30 of Pickaway Township, Shelby County. This fine farm is the same which he secured from the Government in a raw, prairie state, comprising two hundred and forty acres. His purchase was made in 1853, and since that time he has bent every effort to making the farm a model of agricultural neatness and productiveness. Our subject came here from Pickaway County, Ohio. He was born September 15, 1811, in Frederick County, Md. His father was Henry Yantis, a native of Maryland and his paternal grandfather was John Yantis, who came to America from Germany prior to the Revolutionary War and made settlement in Maryland. As far as our subject knows, his grandfather did not, however, take part in the war, but after the death of his wife, he went to Ohio with his sons, where he remained until his death. His wife was a native of Maryland, who lived and died there at an advanced age. It was about 1815 when John Yantis, our subject's grandfather, came with his grown sons to Pickaway County, and there he lived for a time in the unbroken wilderness. After a time he went with his son William to Franklin County, Ohio, at which place be died when past ninety years of age. His death, however, was caused by an accident while he was assisting his son in rolling logs. He and his wife were members of the Presbyterian Church and politically he was a Democrat. Henry Yantis, the father of our subject, was probably the eldest of his father's children, of whom there were seven, four sons and three daughters. He attained his growth and manhood in Frederick County, Ohio, and was married to Miss Catherine Yantis, an own cousin, whose father had emigrated from Germany. The parental family comprised five children, namely: Lydia, Solomon, Elizabeth and Catherine, besides the subject of this notice, the latter being the only one now living. Our subject's family settled in Pickaway County, Ohio, when he was but a lad and they there began life as pioneers in the woods. Henry Yantis and his two sons cleared three farms in that county and there our subject's father died when at the age of eighty-seven years and nine months. His wife had preceded him to a better world some time at the age of seventy-five years. They were members of the Presbyterian Church and were good, true, unaffected pioneer people. Our subject became of age in Pickaway County and there in 1833 married Elizabeth Longenbach, a sister of Isaac Longenbach, a history of whom may be found under the biographical sketch in another part of this volume. Mrs. Yantis was reared in Pickaway County. The young couple took up the burdens and joys of life together and after the birth of all their children but one, they left Ohio, coming with teams by way of the overland route and living a camp life on the way. They made the journey one of pleasure instead of discomfort and enjoyed the trip probably more thoroughly than do we of to-day, who are hurried from one end of the country to another in the space of a few hours. They reached their destination without accident, and at once settled on the tract which Mr. Yantis had secured previous to bringing his family hither, having made a journey on horseback and reconnoitered the country well in order to select a good location. They began life in their new home on an entirely unbroken farm, and although there were many privations and inconveniences in living so far from neighbors, they made the conditions as pleasant as possible and the children grew up knowing that they held resources within themselves irrespective of others. After securing their home, our subject and his wife took pleasure in bringing about them comforts and even luxuries of life. They put up good buildings on their place and as they were the representative people of their township and leading citizens thereof, they were naturally the center of social life. Mrs. Yantis passed to the other world February 16, 1890, after having lived with her husband in a close and tender companionship for fifty-seven years. She was born December 2, 1809. She was a noble woman being of the fiber of which heroines are made, and her character was beautified by a lovely temperament and genial, kindly manners. She was a good wife and mother and a kind, thoughtful neighbor. She was the mother of fifteen children, six of whom, however, died. They were Mary, David, Mary, Sarah, Lydia and Jacob. The living are: Samuel, George, Henry, Solomon, Elenore, Isaac, Daniel, Barbara and John W. George W. is a farmer in this township, and made mistress of his heart and home, Miss Lucinda Tolly, who died, and he later married Mrs. Mollie Smith. Henry is a merchant in Yantisville, this township, and married Barbara Longenbach. A biographical sketch of Solomon may be found in another part of this volume. Elenore is the wife of Nathan Killam, and now resides in Elk County, Kan., on a farm. Isaac took to wife Emma Pogue, and lives in Moultrie County. Daniel is the proprietor of a livery stable at King City, Mo. He took to wife Mary A. Klar. Barbara is the wife of James Murcer and they live on a farm in Texas County, Mo. John, who is a resident of Shelbyville, first married Lucy James, who died, and afterward took to wife her sister Cordelia. Mr. and Mrs. Yantis have for years been members of the Reformed Presbyterian Church and are highly regarded among the people. He has been the Assessor of the township for three years and has had other local offices. He is an adherent of the Democratic party both by tradition and conviction, for as will be seen above, his father and grandfather before him were followers of that party. Our subject cast his first Presidential vote for Gen. Jackson. Extracted 11 Jan 2018 by Norma Hass from 1891 Portrait and Biographical Record of Shelby and Moultrie Counties Illinois, pages 346-348.